In the restaurant review that follows, I may be as cruel as Nero and as perverse as Elagabalus. The places you are about to read about have a huge advantage over the critic. Nothing I write here will have the slightest consequence. Diners at these establishments have no interest in food columns. But readers may be tempted to take a trip back in time – before we became oh-so-sophisticated about food, to when South Africans were content with dubious imitations of European fare. These places live on in the city as part of its furniture, in wi-fi blind spots, comfortably tucked away, where food styling, the latest imports, changes in taste and health scares pass by unnoticed. The closest they might ever come to fusion cuisine is a ‘Hawaiian’ or a ‘Mexican’ pizza. They are our oldest Italian restaurants. Family owned and run, they had their heyday in the 1960s and 1970s. “We used to have parking for 80 cars,” Angelo Inzadi, the Milanese founder of the Harlequin Restaurant (opened in 1965) tells me. He blames television for the decline. “Rich Man, Poor Man!” he laments, referring to the TV series that gripped the nation on Saturday nights in the 1970s. Longtime associate Americo Zuccato has taken over, but the elderly Inzadi still comes in. “What must I do sitting at home?” he pleads, shaking his hands the way Italians do when they want help from the mystery above. At least here, he says, he gets to greet the occasional old friend, raise his voice at the staff, and break a few plates. The Harlequin still has its name emblazoned in neon letters, waving down traffic on Parow’s varicose thoroughfare, Voortrekker Road. The interior is spacious and comfortable, lit with that cold, energy-saving light; the backdrop, a wall with two faux brick arches framing a giant mural of Lake Maggiore. The pizza oven is now only ornamental. On every table, a solitary pink rose stands alongside those 1970s all-purpose liqueur glasses filled with toothpicks. The menu is old South African, with an extensive “grills and accompanies” section – monkey gland steak and sirlion [sic]. There is one notable exception – rabbit stew. Starters range from shrimp cocktail to tuna salad with a half-dozen garlic snails in between. The carpaccio is as pink as it comes; the deep-fried calamari tentacles are good too. The garnish is exactly as it always was – a raw onion ring on a slice of bloated tomato. I have no real complaint with the mains I try: osso bucco, fillet of kingklip, ‘baby beef’ and mushrooms. The staff are pleasant. There is no fuss and no pressure. The music is a variety of mod Italian crooners – Ivano Fossati, Andrea Bocelli and Gianni Togni. And there is wine for as little as R70 a bottle. One finds oneself lingering. But I skip dessert. A plastic menu card with photographs of the food is as good as a warning sign. Even older than the Harlequin is La Pizzeria Napoletana on Main Road, Sea Point, which opened in July 1957. According to architect Robert Silke, whose Caligula-like appreciation of yesteryear I share, when Luigi and Maria Parletta proudly opened it, domed pizza oven and all, they could only serve fried margaritas, because the “forward-thinking Cape Town municipality” required wood ovens “to have operating licences from the Wheat Board and the Milk Board, as well as special dispensations in terms of the Munitions and Explosives Act”. In the United States, they call such places mom-and-pop restaurants. Today, out front, you will usually encounter son-in-law Piero Tarantello, originally of Sicily. 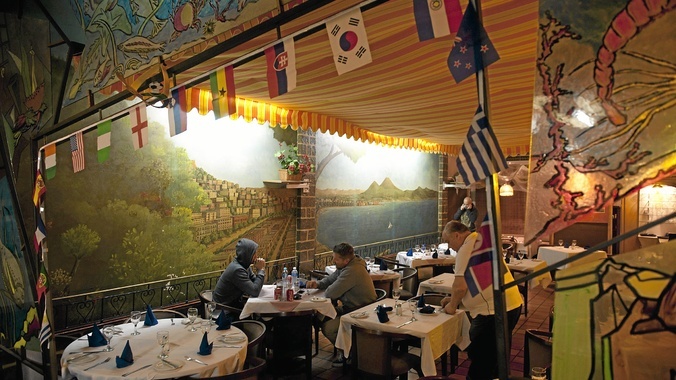 The wall painting here is of the Gulf of Naples, strangely unpeopled; the ceiling is disguised with a striped canvas awning; where the mosaic tiles at the entrance counter have fallen off, there is a Prestiked paper sign; reed blinds hide the scullery; tavern lights warm the room; a beaded curtain and glass panels decorated with marine life complete the time warp. Eros Ramazzotti plays in the background on a loop. On the white china plates, you can just make out the faded words “ciao Italia” in patriotic green and red. The bottle of olive oil on the table still has the price tag – R87.95. The stainless steel sugar bowl is the same as those in state old-age homes; in it, a few tired packets of sugar. The waiter gives a nonplussed look. So too my pizza base; if it wasn’t an industrial, frozen supermarket one, then it did an excellent impression. The ostensible Italian salad is iceberg lettuce, strips of sweet peppers, red onion, a shredded anchovy fillet and five black olives, served with thin creamed vinaigrette. The mozzarella in the Caprese salad is yellow. I can hear the meat being tenderised in the kitchen and the mixing and beating of sauces. The coffee smells like burnt popcorn. The saltimbocca Romano arrives. It’s not half bad, though I can’t quite figure out why it has three toothpicks embedded in it. The irony is that these days you can easily do much worse dining out in the real Italy. This article first appeared in the Mail & Guardian on 8 August 2013.